The Central Bureau of Statistics announced on Thursday that the number of fixed lines by 5% during 2017, indicating that the number of mobile lines reached 40 million lines. "The number of fixed telephone lines reached 2.1 million lines for the year 2017 compared to 2 million lines for the year 2016, a rise of 5 percent," the ministry said in a report received by "Economy News" a copy of it, "noting that" Iraq, except Kurdistan, was 7.3 per 100 people, while the provinces of Najaf and Diyala occupied the highest percentage of telephone density and by 12.1 and 10.4, respectively. 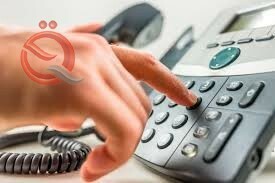 He added that "the number of mobile lines of companies operating in Iraq, including the province of Kurdistan amounted to 40 million lines, while the telephone density of those phones per 100 people 107.7 for the year 2017, while the number of wireless telephone lines for companies operating except Kurdistan province 634.4 thousand lines for the year 2017 ". "The number of mobile Internet service lines for companies operating in Iraq is 19.2 million lines, while the wireless Internet service of companies operating in Iraq is 185.1 thousand lines for the year 2017," the agency said.